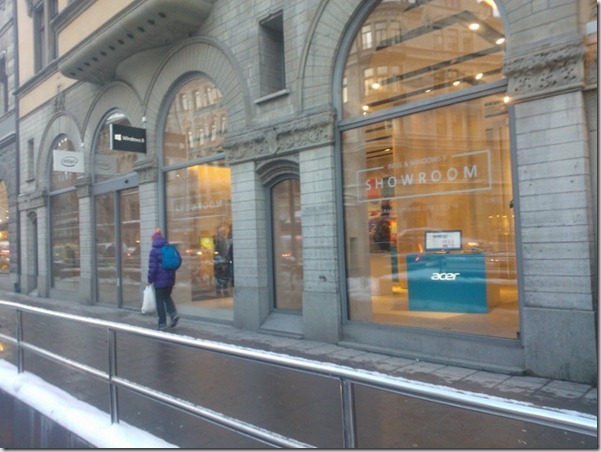 Recently, Intel and Microsoft have opened up their own Windows 8 Showroom in Stockholm, Sweden. This cool event is set to feature OEM’s like Asus, Acer, HP, Lenovo Samsung, and are all put on display to show their latest products with Windows 8 to the public until January 31st 2013. At every OEM station, you will see a product in a category meaning if an OEM had their own “All in One PC” they would be presented in luxury fashion in that given station. Being an “Intel Showroom,” it does mean unfortunately that Windows RT wont be making an appearance. Were told that there is also Xbox stations there so you can try out nice things like Xbox SmartGlass. It’s not a retail store, but if you like to check things out before making a big purchase and you just so happen to be in Stockholm, Sweden this is one event you don’t want to miss. Doors are open from 10:00 AM to 7: PM from Monday to Friday, 10:00AM to 5:00 PM on Saturdays and 10:00AM to 4:00PM on Sundays. The address is: Birger Jarlsgatan 15, Stockholm. Go to Wingadget.se to learn more! Written by: MBGW on December 15, 2012.